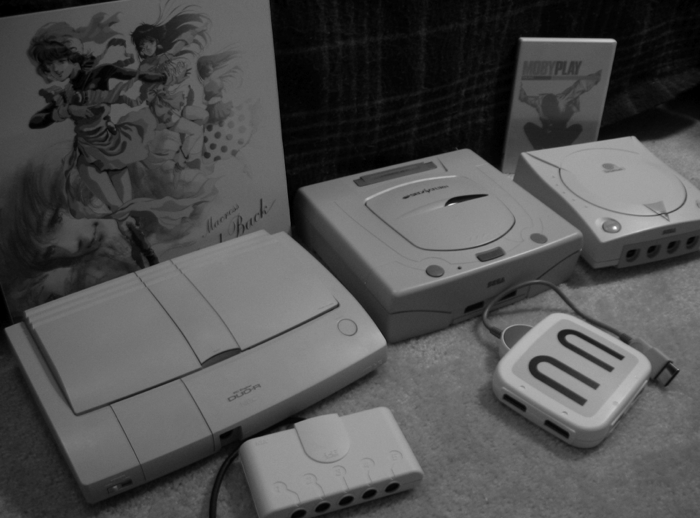 This page explores the unique game aesthetic that began with NEC’s PC Engine, continued with the Sega Saturn, and sadly ended with the Sega Dreamcast. Shown here are all three systems in order of spiritual succession. Behind the PC Engine on the left we see a Laserdisc, the premium home video format in the PC Engine’s day. A special LD player known as the Laseractive was PC Engine compatible, but unpopular, and the market deemed it unnecessary. On the right we see the Dreamcast, and behind that a DVD, the premium home video format of its day. Ironically the lack of DVD compatibility is often sited as a key reason that the Dreamcast didn’t live to maturity. Between them we see the Sega Saturn, which bridges the gap perfectly. All of these systems are famous for oddball simulation series, quality ports of arcade fighting, and shooting games, and highly original, and creative first party releases that defined the machines. You won’t find many dedicated gamers that have owned only one of these machines. This page explores the many common attributes of all three systems. The sort of titles and wacky hardware that typified The White Line, have moved on to other systems from other companies. However no one system can now be purchased with confidence that it will be the same sort of machine, with the same sort of hardware, and software that we saw in these systems from NEC, and Sega.